Graduate students inhabit the same campus as the College’s undergraduate population, but experience different forms of academic and social life. Hanover native Tapasya Govindarajan Tu’15 said that her experience at the Tuck School of Business has been “amazing.” While she said that Tuck does feel very separate from the College, she does use many College facilities. Govindarajan explained that scheduling for Tuck students changes from first years to second years. She said that first years’ schedules depend more on core classes, such as statistics, finance, marketing and accounting, in a group setting. “You are not only balancing your schedule but coordinating with a group of five,” she said. The emphasis on group work is a crucial part of the mission statement of the graduate school, which dedicates itself solely to MBA programs as the country’s first graduate school of management. By spring term of their first year, Tuck students’ schedules become more specific to individual interests. “You can arrange the way that meets your schedule and preference needs,” Govindarajan said. She also said that professors are generally very accommodating with their time and that they are very reachable by email. Jeff Weiss ’86, consultant and adjunct professor at Tuck, said that he thought that Tuck and the College were becoming more united academically, a sentiment contrary to Govindarajan’s opinion. While that program no longer exists, Weiss said that the graduate school is further developing the Tuck Business Bridge Program, which offers undergraduate students the opportunity to study at Tuck over the summer to develop quantitative and group-based skills. He also said that graduate students at the College share similar interests with undergraduates, such as a love of sports and the outdoors. “That’s why people come to Hanover in the first place,” he said. Weiss also explained the grading system at Tuck, which is very different from the traditional A through F scale found at the undergraduate level. At Tuck, he said, Honors, Plus, Satisfactory and Below-Satisfactory grades are given. Kevin Johnson, a PhD candidate studying molecular biology at Geisel, said he feels Geisel and the College are very separate. Johnson also said that most undergraduate students seen around the Geisel campus are pre-med students doing research with professors. He accredits this to the separation between the Geisel School and the College’s campus. As one of the relatively few PhD candidates in Hanover compared to larger research institutions, Johnson and his fellow PhD students are assigned to a professor with they work closely.“You work for [your professor] daily. They’re your advisor, mentor, they give you career advice and academic advice,” Johnson said. The grading system at Geisel is different from both the College’s and Tuck’s. Geisel uses a high-pass, pass, and low-pass system. Johnson said that most of his PhD colleagues are exceedingly driven to achieve a high-pass. Johnson also said that his work at Geisel has mostly consisted of review of previous materials and that he has had less coursework and more freedom in graduate school. 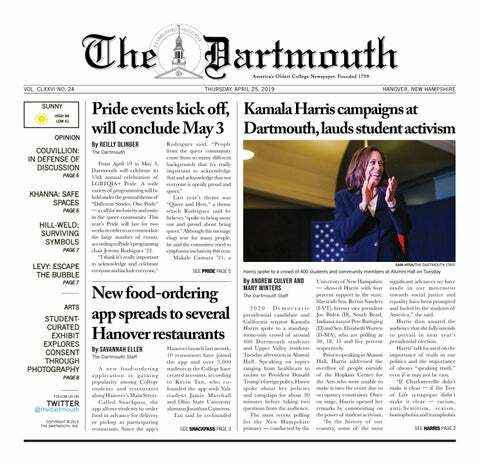 While undergraduates occupy their time at events planned by student groups, including Greek organizations, Johnson said that graduate students in Hanover have fewer options. Corrections appended (Feb. 8, 2015): The online version of this story previously misidentified Kevin Johnson as Kevin Jones. The Dartmouth regrets this error. The previous version also described Johnson as "one of the few PhD candidates in Hanover." The story has been corrected to read "one of the relatively few PhD candidates in Hanover compared to larger research institutions" to reflect the fact that there are several hundred PhD candidates in Hanover.